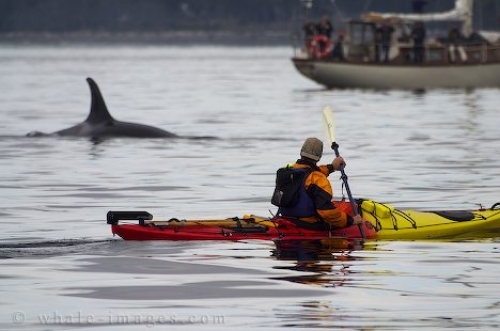 Many tour operators offering kayaking tours with Orca Whales. Most of the kayaking with the whales is done off the Northern Part of Vancouver Island in British Columbia. Most kayaking tours covering great orca whale watching places like Johnstone Strait, Queen Charlotte Sound and the mouth of Knight Inlet at the Broughton Archipelago Provincial Marine Park (between vancouver Island and the British Columbia Mainland). Kayaking with Orca Whales and especially a close encounter with an Orca Whale (in case that they decide to visit you close) is a once a lifetime experience. It is highly recommended to use a guide or a touroperator to do some kayaking with Orca Whales, the waters off Vancouver Island can be quite tricky for paddling, so a experience leader makes a lot of sense! Here you can find more pictures about kayaking in British Columbia.